(EN) Paris, Vienna, Shanghai, Vienna and always back to Paris. Camille Boyer is in mission mode and already traveled half the world. She’s studied, designed, taught and sold fashion. (EN) For the past 15 years she’s lived in Vienna and her presenceensures that the local scene is a tick more international. Together with Marlene Agreiter she’s founded the AFA, the Austrian Fashion Association, which serves as an important interface between creative and classical economy. The AFA decided on the allocation of fashion subsidies of the Austrian federal government and the city of Vienna, through which designers obtain structural and financial support. (EN) The office of the AFA is a small treasure located in the Lindengasse. The flexible concept of the space of artists Benjamin Hirte and Nick Oberthaler also serves as an off-space for roundtables, exhibition and the presentations of local designers. And, sometimes, as with today, it functions as a space for exquisite clothing pieces. That’s because while working on the preparation of the Fashion Awards in the back part of the office, the creations of AFA protégés are collected in the front of the office on two hanging rails to be auctioned at the awards ceremony. Camille and her partner Marlene Agreiter talk to us about their hometowns and Paris and their work with the hottest designers. (EN) You’re from France but are now in Austria as an assistant in development in fashion. Would that be an accurate summary? (EN) Camille: Yes, actually in the Austrian fashion business I’m more like a woman of all trades. (EN) What originally brought you to Vienna? (EN) Yet, Paris is the city of love. (EN) Camille: When I left Paris, I was somewhat over-saturated and happy to come to Vienna. I like new challenges and in Vienna I’ve found them. Here we have this wonderful opportunity to promote designers. (EN) You don’t miss the habits of the Paris fashion world in Vienna at all? (EN) Camille: In Paris, people are dressed well. That’s quite a treat. And of course there are the great fashion houses there. But I’m from a scene of innovation and conceptual young designers – it’s rather small. And it’s more interesting in Vienna. (EN) Other than the office where do you go in Vienna to see well-dressed people? (EN) Camille: We are getting exactly these kinds of questions from the press and always answer: in the airplane on the flight between Paris and Vienna on the way to fashion week. This is almost our running gag. But seriously: In Vienna you’re more likely to turn a corner and suddenly find someone with a great look. (EN) The Austrian Fashion Association was established to make Vienna more beautiful. How did it come about? (EN) Marlene: Camille and I met in 2010 through the “Cooperation Exchange MODE.” The fashion funding of the Federal Ministry of Education, Arts and Culture had just been rewritten. (EN) Who is the focus of your work? (EN) Marlene: There are people who apply directly out of the university and wanting to start a label. We also support designers who may already have experience abroad and want to advance their fashion careers. This is important because you won’t be successful after just two years in the fashion business. This year we had our first run with a very mixed portfolio of projects. Five of the projects supported by us are quite young. (EN) How do you work with the people who come to you and that you are promoting? (EN) Marlene: The fashion industry produces thousands upon thousands of collections every year, but in contrast, contemporary fashion is a niche market in which one must position themselves as a young designer. We advise and sharpen the view in order to master this perspective. (EN) Does it sometimes happen that you rediscover the advice you’ve given in a final collection? (EN) Marlene: Our role is to stand to the side of the designers and when the going gets tough, to offer a hand.I would never engage in the creative process. But of course you see the strengths, Camille is better at it than I am. (EN) Is your cooperation always so smooth or do you also have more intense discussions sometimes? (EN) Marlene: Interestingly enough, often we have very similar thoughts without discussing it. Also in which direction to advise a designer. (EN) It is also a question of taste or is that not an issue? (EN) Camille: No, because tastes are different. It’s about the potential that someone has. (EN) How do you secure the potential of a designer? (EN) Camille: Fashion and clothing are indeed two different things. Fashion includes a personal attitude and reflection and clothing is the pure work product, which is characterized because it is functional and repeatable. (EN) Marlene says you have a better eye for the strengths of designers. Why is that? (EN) Camille: I studied fashion, but also know the buyer’s side because I had my own business. I’ve taken many young designers to Paris and supported them at trade shows, in sales and in PR. Because I’ve worked in so many areas of the fashion industry I have a good overview of the business. (EN) I suppose, running your own shop has a pretty fantastic effect on your wardrobe? (EN) Camille: It’s really helped me fill my own closet. (laughs) As often as possible I buy young Austrian designers. But I really don’t like shopping so much. (EN) What do you like about Vienna, other than the fashion scene? (EN) Camille: I’m really happy here, the city is very comfortable. Paris is wonderful, I’m there often, but it’s always stressful. In Vienna it’s easier to concentrate on what’s important. (EN) What do you miss when you’re in Vienna? (EN) Camille: In Paris I really like the openness of the people, these little, friendly moments of small talk at the bakery and so on. I miss that in Vienna a bit. 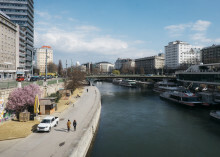 (EN) What are your favorite places in Vienna? (EN) Camille: The Café Mentone is like our second living room. The coffeehouse has a retro flair and a French-Viennese charm. It’s in the Kirchengasse, which is quite a Francophile place anyway. The entire seventh district is very nice. I live and work directly there. My children also go to kindergarten there. (EN) A View over Vienna - "Am Himmel"
(EN) Does that mean that you haven’t left the seventh district for a few years? (EN) Camille: Sometimes, unfortunately, I must. (laughs) No, but what I find really wonderful about Vienna is that you can get out of the city very quickly. It’s something special. (EN) That would be really easy to understand in the wrong way. (EN) Camille: Yes. As a Parisian, I wasn’t a nature-lover. It’s something that I discovered in Vienna. When I’m not working I like to go walking in the forest, it’s a wonderful opportunity to switch off, to be in another universe. (EN) Where do you like to go? (EN) Camille: Actually, Vienna is very beautiful as a whole. In the summer it’s great to go to the Heuriger, the wine taverns in Austria. I also like to go climbing in Wachau or for a swim in the Danube River. My two kids are like little fish. In Paris we couldn’t do all these things. (EN) What would you do in Paris instead? (EN) Camille: In Paris you go to the café on the weekend, not to the forest. (EN) Thank you to Camille Boyer and Marlene Agreiter for their hospitality and the wonderful conversation. If you would like to learn more about the activities of the Austrian Fashion Association, you can do it here. Discover all of the FvF Videos, here.